The joint analysis of CMB data by BICEP2 and Planck was posted to the arXiv a few days ago. You can find it here. Last year, the BICEP2 experiment announced – to great fanfare – that they had found evidence of primordial gravitational waves, as would be expected to be left over from inflation, in their measurements of the polarization of the Cosmic Microwave Background. It’s being reported that a new joint analysis of BICEP2 and Planck data has been submitted to PRL. The paper, which isn’t out yet, apparently says that in the joint analysis the significance of the BICEP2 result goes away. The new result, which should be more powerful, is consistent with no signal. This shows the dangers of releasing data – and especially possibly controversial data – before it’s ready. It also shows the dangers of trumpeting results to the media before there’s been time for the scientific community to fully vet a result. I haven’t had a physics post in a few weeks, so here’s another one on dark matter. When trying to find evidence for dark matter or trying to understand its effects on the universe, it is often necessary to have some sort of estimate of its density. The most directly measurable form of the density is the mass density (or energy density, but these are the same if the dark matter is nonrelativistic). The number density is important in understanding things like even rates for interactions of particle dark matter, but typically we use a mass density estimate and then report measurements as a function of particle mass. There are also two types of relevant density measurements: the average density throughout the whole universe and the local density in some region of interest. 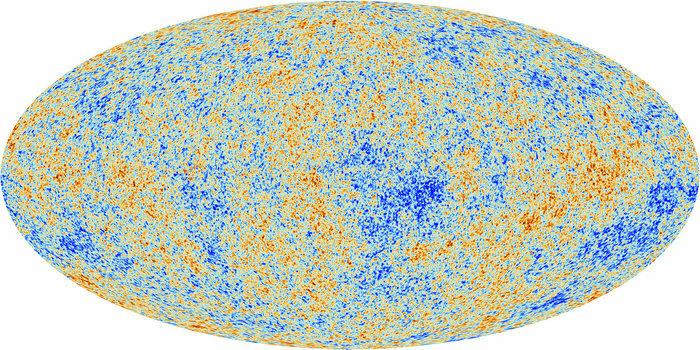 The average dark matter density throughout the whole universe can be determined from cosmological measurements, such as studies of the CMB. This density is most important in trying to understand the evolution of the universe. The presence of dark matter changes the gravitational forces felt by the photon-baryon fluid making up the universe prior to the epoch of recombination. This changes the properties of oscillations of that fluid, allowing the effects of dark matter to be seen in the shape of the CMB power spectrum. These measurements tell us that the overall dark matter density is around 1/4 of the critical density (where the universe is flat). The critical density is incredibly tiny compared to what we’re used to: of order 10 GeV per cubic meter. Much of the evidence for dark matter comes from different ways to try to measure the local dark matter density in some region of space. The motion of objects in a gravitationally bound system lets us estimate the gravitation potential as a function of position, which in turn lets us map out the energy density of the system. Gravitational lensing lets us measure the strength of gravity acting on photons, which also lets us do the same. One density of particular interest to us is the local dark matter density at the position of Earth. Knowledge of this is necessary if we wish to measure dark matter interactions in detectors. Careful measurements of the motion of star systems within the Milky Way tell us that the local density at Earth should be around 0.3 GeV/cm3. This is orders of magnitude higher than the average density of dark matter in the whole universe but is still a very small number. This is only a fraction of an atom per cubic centimeter.